The first round of playoffs is done! Grumpy Old Men move on to the finals with a win over Galaxy Fishers, and Rag Doll Cats barely edge out Da Happy Couple, winning by only 297 points! The final takes place this week, good luck to the teams involved! The regular season is over! 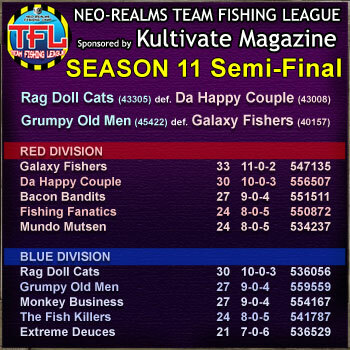 In Blue Division: Rag Doll Cats and Grumpy Old Men are advancing to the playoffs with Monkey Business and The Fish Killers finishing in the money. 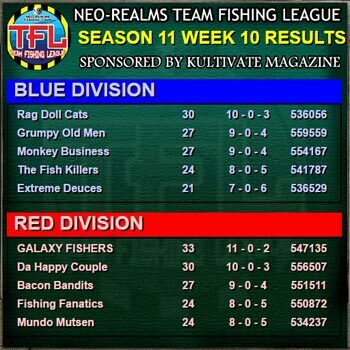 In Red Division Galaxy Fishers and Da Happy Couple moves on with Bacon Bandits and Fishing Fanatics. Playoffs begin this week, with Rag Doll Cats vs Da Happy Couple, and Galaxy Fishers vs Grumpy Old Men. Good luck! We are down to the final week of the regular season! In Red Division Galaxy Fishers has clinched first place and the top playoff spot, with Da Happy Couple and Bacon Bandits fighting for the number 2 playoff spot. In Blue Division: Grumpy Old Men, Rag Doll Cats and Monkey Business are all in the running for the playoff spots, with Monkey Business having a game in hand. There are still many in contention for the top 4 money spots, so good luck all teams this week! 2 more weeks left in the regular season! In Blue Division, Rag Doll Cats are on top with Grumpy Old Men and Monkey Business tied for the second spot, with Monkey Business having a game in hand. In Red Division, Galaxy Fishers are on top with Da Happy Couple and Bacon Bandits close behind with a game in hand. Good luck to teams this week! The top 2 teams in each division will be going on to the playoffs, not top 4. Sorry about that!